My mother recently sent me a huge bag of shinmai from Japan. Shinmai is literally new rice, rice that was harvested this season. It really tastes wonderful; there is very little nuka (rice powder) around it, and when it's cooked, each grain seems to glisten. I reserve this rice for use when the quality of the rice is really important, such as for this classic combination of plain rice and umeboshi, or pickled plum. The clean blandness of the rice is a perfect foil for the mouth-puckering sourness of the umeboshi. My grandmother used to make her own umeboshi, but hers was always so salty that the surface would be flecked with salt crystals after some time. The ones that are popular recently are far less salty, so that the flavor of the ume itself comes through a lot better. 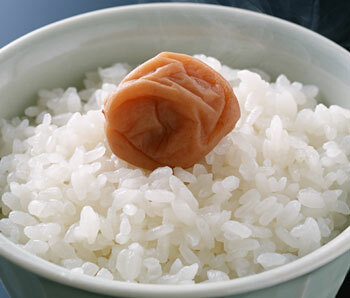 When I eat umeboshi with gohan I realize that wherever I may roam, I remain Japanese in the tummy. Submitted by maki on 2006-01-05 06:06.